I was lately reminded of the modern-day Alice in Wonderland adaptation called Alice from the year 2009. From what I know, not a lot of people have heard about it, so I think it deserves a little review/introduction. Alice’s father disappeared when she was young and she has been looking for him ever since. That made it difficult for her to form lasting relationships and when her boyfriend Jack offers her a valuable ring she freaks out a little. 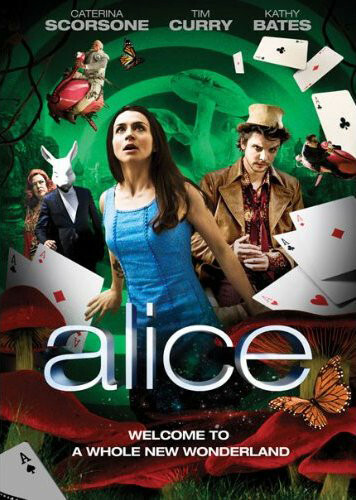 But soon after that, Alice has to witness Jack being abducted by several men and she follows one of them, the White Rabbit, through a looking glass into what seems like a different world – Wonderland. Alice is definitely very far off from the original Alice in Wonderland tale and also a lot more adult. The White Rabbit and his men are basically some sort of mafia, the Mad Hatter’s tea house is a stock market for types of teas that are people’s emotions and the Queen of Hearts owns a casino. Wonderland has been wonderfully corrupted and needs Alice help now. The CGI is terrible most of the time, but I like the overall style. Somehow it captivated me and that is coming from a huge Alice in Wonderland fan. I guess the highlight was definitely Andrew Lee Potts as the Mad Hatter, who is next to Sebastian Stan on Once Upon a Time one of my all-time favourite contenders for the role. Caterina Scorsone gives us a very cynic Alice for a change, which also makes the story more interesting. If I had to complain about something, then I would say that it wasn’t strictly necessary to make it that long. There are some tidbits inbetween that are a little psychedelic and not really after my taste. However, I love the ending and that’s what really counts. Fazit: Please don’t expect a masterpiece, but I think that this is definitely a fun and different Alice version worth watching! Have you maybe already seen it? Would you want to watch it? I love this little series! Yes, mostly because of the Hatter, but it’s still great. Yay! I am glad I am not alone with this! The hatter is amazing, but absolutely, the series is great as a whole! I actually loved this whole idea of degenerated Wonderland after Alice left it for the first time. That’s what I liked too! They really put a lot of thought into that and I think it worked out great, because it could have easily backfired. I myself didn’t care for it too much, but my wife loved it. Good review. I saw this back in high school. At the time I enjoyed it, though now I find the whole thing maybe a little too ridiculous, even for Wonderland standards. Then again, that may just be me. The Hatter follows Alice into her world and they get together 🙂 they were so cute as a couple. That’s why I loved it I guess.